Stop reaching so many disconnected numbers and start reaching real customers. We identify which numbers are good to dial and which ones are disconnected. We can quickly check any phone number, cellphone or landline as long as it is within the US or Canada. Our verifications are done via database lookups to major telecom companies. While doing lookups via a database reduces some accuracy, we are able to provide a rate of 80%. We can help you identify if the phone number your user provided was a cellphone or a landline. We can also narrow down the city and state if you are looking to target specific areas. Other companies that claim to have the highest rates are using an auto dialer solution. Auto dialers are not a best practice because it can result in an actual call being sent to the phone, which is not compliant with TCPA guidelines. phone numbers from getting into your database. Our phone verification solution will help you significantly reduce invalid data while keeping your cost low. Validating phone numbers in real time will help your business better connect with your customers. We can also append the phone type so that you can stay compliant with rules and regulations. Don’t waste time and money on leads that only lead you to dead ends and disconnected phone numbers. Xverify's phone verification service allows you to validate landlines and cell phone numbers within the U.S. or Canada. 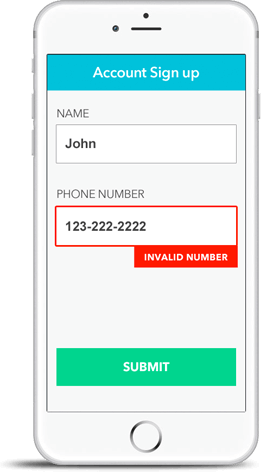 You can validate phone numbers in real time across any channel or via automated batches. During the validation process, we first check to make sure the area code is accurate and that there is no formatting issues. Then, we run the check against the telecom database records to ensure it is a legitimate line. Phone verification has helped our call center tremendously. We have cut down on an average of 12% invalid phone numbers, and this has literally saved us thousands of dollars. Otherwise, we would have just blindly paid for this false leads. Our pricing is simply pay- as- you- go —, no minimum requirement, or long- term commitment. If you don't use the services, we don't charge you. Our pricing starts at $0.01 per verification. If you have more data, we can offer you volume discounts. What is your phone verification accuracy rate? Our phone verification solution is about 80% accurate because we are performing a database lookup with telecom companies to identify if it is a real number. Sometimes phone numbers will come back as valid, but you might find they are disconnected. This is because it is likely the phone number has gone out of service in the last 60 days and has not yet been updated with the telecom database. Can we verify a list of phone numbers? Yes, you can upload a list of phone numbers through our batch processing tools. Simply make sure you have a .CSV file and that the column that contains your phone numbers has a header of "phone." Do you make any phone calls to verify the numbers? We never call your users. Instead, we are just looking up details from a database. As long as the telecom companies report that the number is in their system, we respond that the number is valid. Use Xverify’s phone verification system and stop wasting time on disconnected numbers.